Is That Any Way to Support Our Troops? A preliminary report by the Department of Veterans Affairs states that benefits for service dogs will be provided to the vision, hearing and mobility impaired. But benefits will not be provided for those with Post Traumatic Stress Disease (note…it is a disease, not a disorder). This ruling will become final in 30 days. 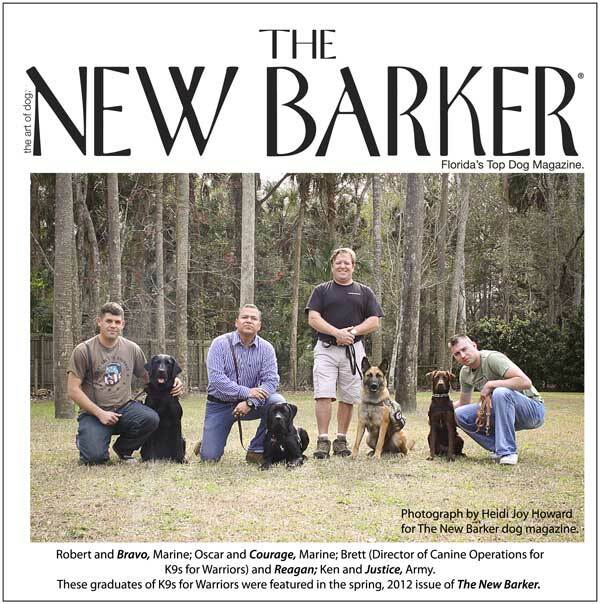 Also, this week in Jacksonville, veterans who were enrolled in the K9s for Warriors program were asked to leave a business in Jacksonville Beach while out on a training session. The owner of Surf and Skate Shop asked the veterans and their dogs to leave his business, claiming disruption of the business. Again, we asked Shari for her thoughts. Who in their right mind, has the guts or the heart to mess with these guys? Photograph by Heidi Joy Howard for The New Barker dog magazine. Please visit K9s for Warriors and Canine Companions for Independence Wounded Veteran Initiative (a national organization with an Orlando center). We have witnessed firsthand the good these two exemplary organizations are doing for our veterans. Again, these organizations are privately funded. They rely on donations in order to provide their services and the dogs at no charge to the veterans. Now that’s the way to support our troops. Keep this conversation alive by sharing this blog with others. Visit the social media sites of each of these two organizations. Many of the graduates stay in touch via these networks. Send them words of encouragement.